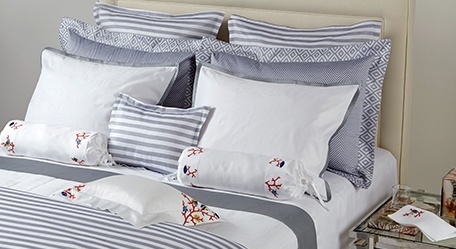 The Silver Peacock is the go to resource for those looking for the finest luxury linens. We offer an exquisite collection of linens for the bed, table & bath, for any aesthetic or style. Luxurious sheeting, blankets, bedcovers, pillows, duvet inserts, throws, and so much more. We are pleased to offer ready-made, made to measure or completely bespoke bedding and bed room accessories, from some of the world’s finest boutique luxury brands, ateliers and workshops. For those of you not planning to visit the New York City area, we are able to service clients worldwide and onsite visits are available when required. Contact us!